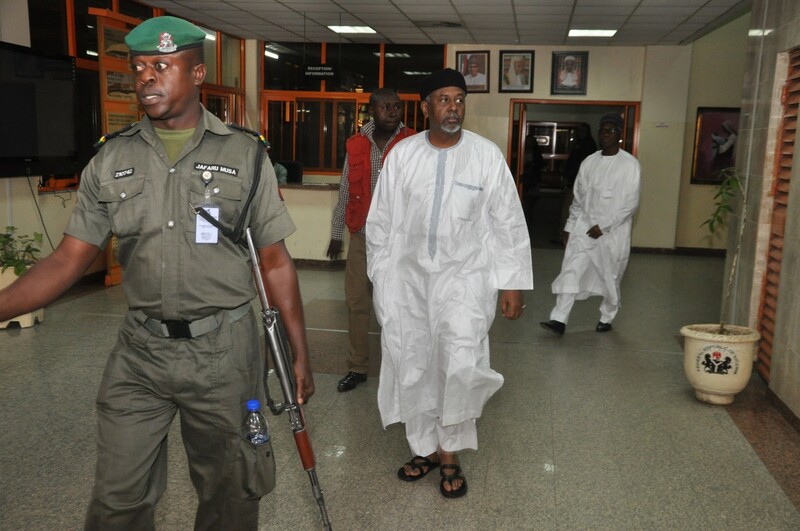 The Department of the State Security Service (DSS) has refused to allow former National Security Adviser (NSA), Col. Sambo Dasuki (rtd) to go home on bail, even after perfecting the third bail granted by an Abuja high court. The DSS in a dramatic fashion on Tuesday night, took custody of Dasuki shortly after perfecting the third bail granted him by Justice Peter Affem after two other courts had done the same. Reacting to the recent development on Tuesday in Abuja, the counsel to Dasuki, Mr Ahmed Raji (SAN) who also confirmed that the former NSA had met all the bail conditions given by Justice Affem, regretted that the court order was not obeyed by the operatives of the State Security Service (SSS). Three separate courts have so far granted Mr. Dasuki bail, who, alongside five others, is standing trial on a 22-count charge for alleged diversion of funds, misappropriation and breach of trust to the tune of N19.4 billion. The charges were brought against them by the EFCC. The former NSA and former Minister for State of Finance, Bashir Yuguda; former Sokoto Governor, Attahiru Bafarawa; ‎and three others were granted bail on December 21 by the Federal Capital Territory High Court in the sum of N250 million each and two sureties in like sum. But even after fulfilling the conditions for his bail by Justice Peter Affe​n​, according to Ahmed Raji (SAN) his lawyer, the SSS has refused to allow him go home. He said rather than allowing him to go, the service took custody of Mr. Dasuki. He is currently detained in Kuje Prisons. Mr. Raji, who perfected the bail conditions, said the former NSA satisfied all the conditions, wondering why the SSS operatives would not obey the court order. He said the action of the security organisation was an affront to the rule of law under democracy. The lawyer appealed to the SSS and the Federal Government to obey the court order and allow Mr. Dasuki to enjoy the bail granted him by a court. Before the bail, the former NSA had previously been granted bail on two occasions. Justice Adeniyi Ademola of the Federal High Court had on November 3 granted bail to Mr. Dasuki, who was charged for unlawful possession of firearms. The SSS however scuttle​d​ the bail the following day as its operative​s​ continued to lay siege on ​Mr. Dasuki’s​ residence in the Asokoro District of Abuja ​where he was kept under house arrest. The service had claimed at the time that the former NSA was under investigation for another offence.